PXE7 61 is a Sentinel SLC/6/30, built in 1955. She has a Duple body (C41C when new to Lewis Meridian of Greenwich) but the bodywork has been altered in this view. We see her parked at East Boldre, near Beaulieu, on 13 April 1986, having been converted to a racing car transporter for Giron Alvis Racing. The PSVC listing for 2012 shows her to be in the care of Spiers, Henley On Thames. The OBP’s authority on Sentinels is Neville Mercer, the joint author of the excellent book on this marque in the Super Prestige series. I hesitate to preempt any comment he might wish to make, particularly since my information source is that comprehensive book, so I will simply say that the correct registration of this coach is PXE 761. Thanks for that Roger copy changed. Oh how I wish that I had come across a SLC/6/30 coach. Many smaller firms fail because they deserve to – not being up to the standard of other products – but not all. Foden successfully made the transition to diesels and only "failed" when PACCAR consolidated them with Leyland and DAF. [They gave up rather earlier on PSVs.] Sentinel, another major steam manufacturer, pioneered horizontal diesels based on that steam technology but then seemed to give up. Their sale to Rolls Royce means that there is a direct link with Rolls Royce Eagle diesels and ultimately the Perkins units in modern DMUs. How I mourn the passing of AEC, Bristol and Leyland but, had things turned out differently, what would the 2013 model year Sentinel have been like? I can’t really add anything, I’m afraid, beyond what is in the book. Does anybody have a recent sighting of this vehicle "face to face"? The last I heard the owner was planning to restore the bodywork to its original condition. 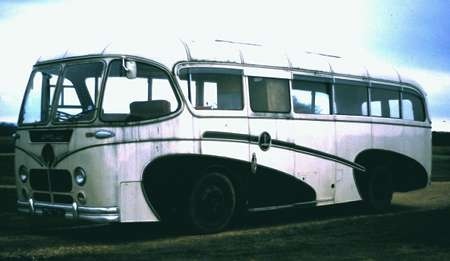 Going off at a slight tangent, Spiers seemed to have a taste for the unusual having once operated one of the two Rutland Clipper/Whitson coaches built in the mid-1950s. What a pity that the Clipper hasn’t survived! Way (way) back in time, when I was an active cross country runner at Blackheath Harriers, I noted, on several occasions, the arrival of a Lewis Sentinel at the Hayes BH clubhouse with visiting teams. This coach could well have been one of these. Unfortunately, I never had a camera with me at the time. Sentinel suffered from the choice of a poor engine design, and then fitted it somewhat less than securely in the vehicle. I understand that the indirect injection Ricardo engine was actually quite an old design that had been languishing in Harry Ricardo’s filing cabinet from pre war days. Perhaps Neville can add some information on this point. The Sentinel concept of both the haulage and passenger vehicles was advanced in the early post war period, and it is sad, in retrospect, that the power unit proved to be so weak and fuel thirsty. It is surprising, also, that very few attempts were made by operators to re-engine their Sentinels with other, more reliable motors. In the late 1940s, few alternative underfloor engines would have been available, but this situation had changed by the early ’50s. The Sentinel was yet another British "might have been". Neville’s comment on the Rutland Clipper is echoed by me. As a Croydonian, I saw one of these – the second one I believe – in the Purley Way area of Croydon quite often. Sorry for the belated response, Roger, I’ve only just noticed your posting on this thread. As regards the re-engining of Sentinels, Midland Red installed one of their own BMMO engines in at least one (possibly both?) of the STC6s acquired from Boyer of Rothley, while at least two of the SLC6s exported to Portugal received Leyland engines later in their lives. The Ricardo designed engines (with the Comet injectors) were indeed quite old-fashioned in post-war terms, and drank fuel like it was going out of style. On the positive side they were probably among the quietest diesel engines ever made. Sentinel compounded the problem of high fuel consumption by fitting the engines in completely inadequate mountings, resulting in the "European" demonstrator dropping its engine while on test with a major Dutch sales target. Needless to say no order was forthcoming!